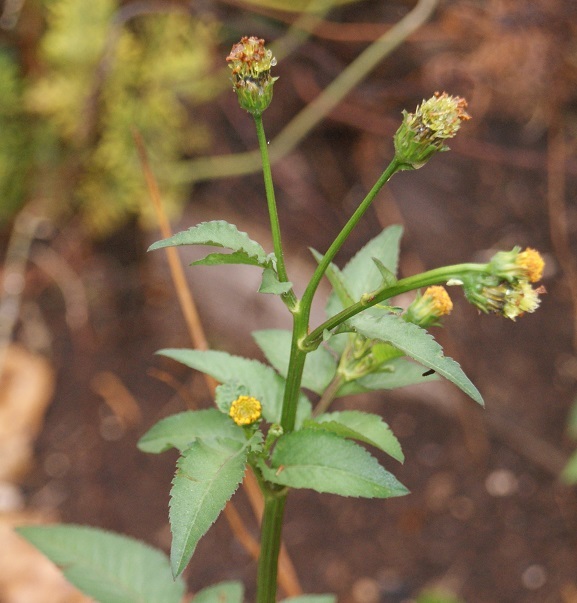 One of the most frequent search terms that appear on my blog relates in some way to Blackjacks (Bidens pilosa), demonstrating that what I have regarded as a pesky weed is clearly of greater interest to others. This piqued my curiosity and so I have put blackjacks under the microscope, metaphorically speaking. The common blackjack is an annual plant belonging to the Asteraceae family. Like so many other species, this plant was collected and named by Carl Linnaeus in 1753 – what a marvellous contribution that man has made to our collective knowledge of plants! How this particular one came to be known as a ‘blackjack’ is anyone’s guess. I have mentioned in a previous post that blackjacks originated in South America and, while it is now common in all tropical and sub-tropical areas throughout the world, it is known that they put down their roots in South Africa over a century ago. This date can be traced to the Anglo-Boer War (1899-1902), when British forces imported fodder mainly from Mexico and Argentina for their horses. Blackjacks formed part of this fodder. These plants are easily recognisable for they grow tall, and have small white and yellow flowers, which then develop into clusters of barbed seeds. The flowers are borne on long, slender stalks at the end of branched stems. Each flower head has four or five short, broad white petals with numerous yellow disc florets which are pollinated by flies and bees. To the dismay of many a gardener, blackjacks are fast growing: flowering starts a mere six weeks after the plants emerge and the seeds mature only a month later! Think about it: each plant can bear about eighty flower heads, which in turn can produce over 3 000 seeds in a single generation. You can see why these plants are widely regarded as a weed. As you can see from the picture above, the seeds radiate outwards and have sharp awns that hook onto passing animals and people as an efficient means of dispersal. Two of the seeds are dangling from the seed head on the left, just waiting to be caught on something passing by. If you look carefully at the flower on the right of the picture above, you will notice the cluster of seeds in the making – quite an arsenal of them packed in tightly! The plants commonly grow in disturbed habitats, such as in gardens, farm lands, and along the road verges. The hot weather conditions in South Africa suit the ideal growing requirements of blackjacks. Heed this anonymous quotation: But a weed is simply a plant that wants to grow where people want something else. In blaming nature, people mistake the culprit. Weeds are people’s idea, not nature’s. A plant as prolific as this must have some uses. 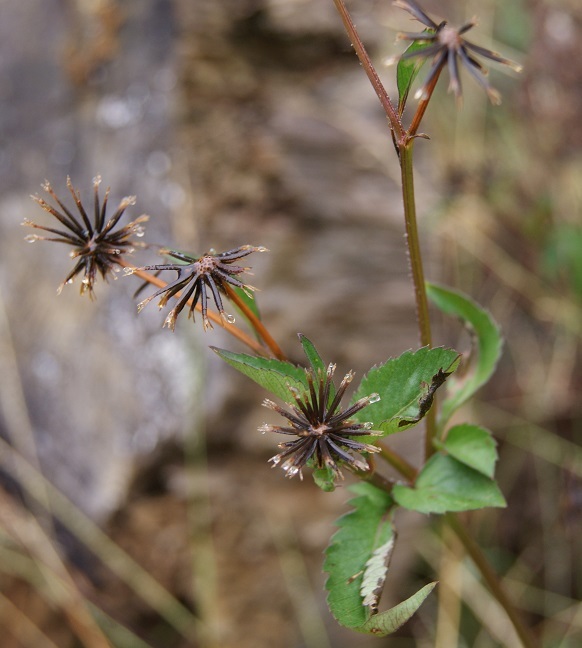 I find it intriguing that blackjack leaves are considered in some quarters as a ready source of food and medicine. It has been recorded as having been sold at local markets in the provinces of KwaZulu-Natal and Limpopo during times when other vegetables are scarce. The problem is that blackjacks cannot be stored for more than a day and so, storing leaves in a ‘fridge or parboiling them before allowing them to dry in the sun are some methods of preservation that have been tried. It is the young plants that are reputed to be the most nutritious as they contain high levels of Vitamins A and C as well as iron, and even protein. 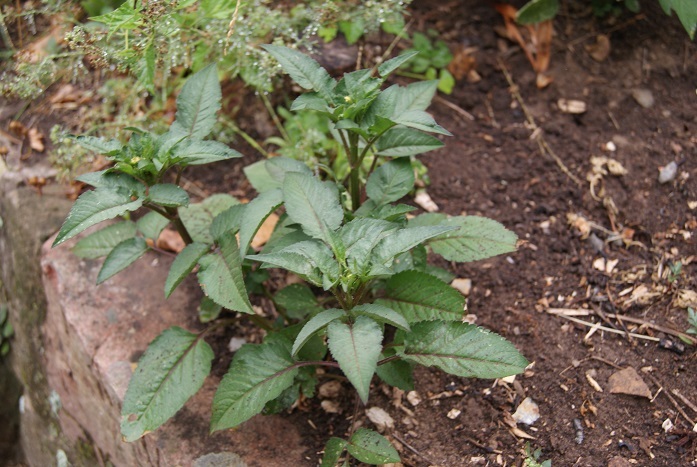 The leaves are generally eaten boiled or stir-fried. I cannot vouch for this, yet I imagine one would have to become used to their astringent taste. The roots, leaves and seeds reportedly possess anti-sceptic and anti-inflammatory properties. 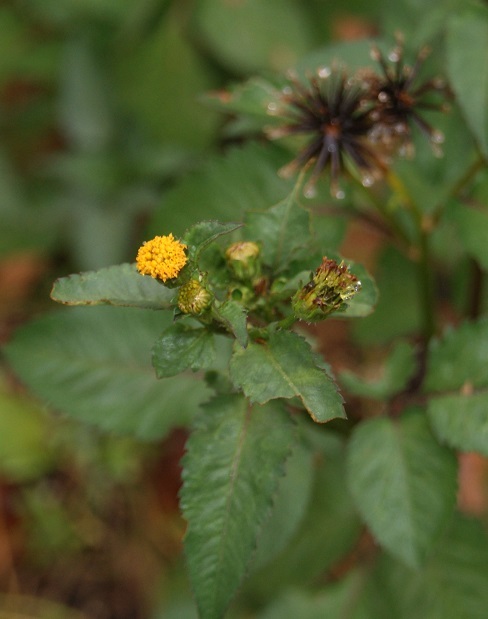 For those who know how to administer the plants medicinally, decoctions of powdered leaves have been used to treat abdominal pains, headaches, and even diarrhoea. Juice from crushed leaves can apparently be used to clean cuts and superficial wounds. It has also been said that the fibrous nature of the plants promote bowel regularity and can ease constipation. 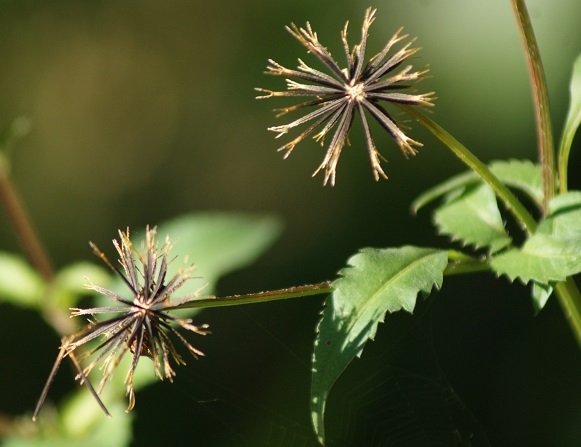 While it is fascinating to know of some of the many uses of this common weed. I wouldn’t try any of the above medicinal applications – that’s what pharmacies and pharmacists are for! Henderson M. and Anderson J.G Common Weeds in South Africa Botanical Survey, Memoir No 37 1966. Department of Agricultural Technical Service. This entry was posted in Alien vegetation and tagged Anglo-Boer War, weeds. Bookmark the permalink. Knapsekêrel in Afrikaans and I’m sorry to say that I certainly have no love for these plants 😜 They grow abundantly among the dense bushes on our coastline and once the seeds attach themselves to our clothes and/or the dog’s fur, removing them is a nightmare. Interesting post. Attractive plant. I enjoyed the quote too! Die feit dat daar wel nuttige gebruik van die plant is, kan dalk help om dit in bedwang te hou, want dis ‘n wydverspreide verpesting. Dankie vir die interessante artikel. Of course I am referrring to the naming of the plant. The ‘hits’ you mention may well be related to the gambling card game!